School psychology practice does not exist in a vacuum and is not value-neutral. 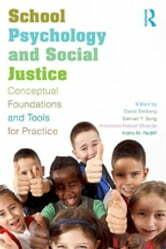 As the role and function of the school psychologist continues to evolve and expand, social justice provides a needed real-world framework for school psychology students, practitioners, supervisors, and professors to guide their efforts. Culled from years of experience by experts working in a vast array of applied environments and appropriate both for practitioners and for graduate courses in multicultural school psychology and/or the role and function of school psychologists, this book takes the reader through a tour of common school psychology topics and functions through the lens of social justice. Utilizing case examples and concrete suggestions, a critical yet hopeful vision of ways in which school psychologists can work to achieve positive outcomes for students, families, schools, and society is provided.